Every summer we have a ride to remember and commemorate our much missed chum Colin Birch, who very sadly passed away on 10th January 2014, after a valiant battle with cancer. We'll be leaving the Arnolfini at 12 noon and we will be riding firstly to Wells, where Colin used to live, where we'll be parking up in the Square for a pasty, then onto Glastonbury and / or Street. 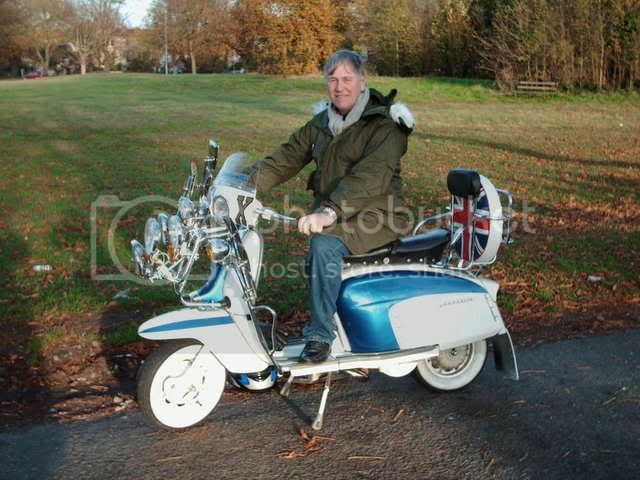 This has been a great day out for us in previous years, so why not join us for a really good ride on the scoots! FOR COLIN'S RIDE OF REMEMBRANCE. Please note. There are building works at The Arnolfini, so you'll have to go round and enter from the other side entrance. You can of course ride directly to Wells and meet up with us there. Colin loved his scooter and loved being part of our club, so this is the perfect way of celebrating his life by doing exactly what he enjoyed doing, out on the scoots with the club and having a bit of fun! Any probs, please contact me on 07816 194736. PLEASE REMEMBER AND RESPECT THAT WE ARE STRICTLY A CLASSIC SCOOTER CLUB. AS ALWAYS, ONLY VINTAGE SCOOTERS FROM AROUND THE SIXTIES ERA ARE ACCEPTABLE ON OUR RIDES AND EVENTS. THANK-YOU. And as always, please take great care and ride safe. Hi Jim, and everybody in the b.m.s.c. they close at 4.00pm. There will be a 10% discount on clothes ,but that's up for negotiations! Rather than temp fate.Hope you all got back safely. Yeah thanks Ian. All got home safe and sound! Many thanks to all who joined us today on 'Colin's Ride'. Every year we take an unusual route to Wells and this year was no exception! Our epic journey today through the back country roads in lovely warm sunhine was nothing short of sensational! Discounting the farmyard odours you always get out in the sticks and the swallowing of the occasional fly, the ride was most enjoyable! Wells was very busy with the Square being closed off for a village type fair going on, where we stopped for the customary cornish pasty! All very tasty, lovely thick pastry with a filling that had a temperature of something near molten lava! Just what you need on a very hot day! Then onto Street! This leg of the journey was ably led by Ian, who assured us that he knew the way! Well, apart from missing the turning off a roundabout clearly marked 'Street', then taking a turning into Clarks Village by mistake, then having trouble finding the shop, Ian finally found our destinatation! Well done Ian - it all adds to the fun of the day! Then back towards Glastonbury for a well earned celebratory pint, only to find yet again, the same as last year, the main street was closed off for a religious march! Trust us to pick the same Sunday again, or is it something they do every weekend! Who knows! So with that plan scuppered, we decided to head for Cheddar. Yet again we went on roads that the guys didn't know existed on a smashing ride through quaint little villages, finally arriving at Cheddar for our well earned refreshing pint. Sitting in the garden of the Riverside Inn in Cheddar, sipping on an ice cold drink in glorious afternoon sunshine with good buddies - does it get any better than this! Out on the scoots with a bunch of mates, in warm sunny weather, with no breakdowns, surely this epitomises what a good day out on the scoots is all about! And I'm sure that if Colin was still around, he would've been with us just enjoying the day! Commiserations to all who couldn't make it today for whatever reasons - you missed out on a good 'un! But there's always the next ride to look forward to! Take care and ride safe, and I'll see you next time!